3 bedroom home in the popular San Souci community that's close to downtown Greenville and just a stone's throw from the swamp rabbit trail, the new hampton station, and so much more! This area is continuously improving and this home is perfect whether you're looking for your first home, downsizing, or as an investment property. Level, fenced-in yard with a covered deck. 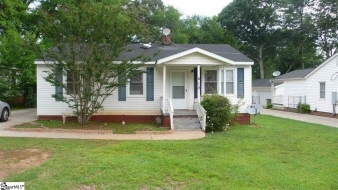 Priced to sell fast at only $82,500 - buy this home before someone else does!